The time saved in carrying water means that women have more time to be involved in productive activities such as agriculture, tending animals or income generating activities. Women are able to send their children (especially female children) to school as a result of not needing children to help with water collection. Both health and hygiene improves across the community. Our wells provide families with ongoing access to clean water which can be used for drinking, cooking, bathing, washing clothes, and feeding animals. The wastewater from the wells is used for home gardening. Common diseases such as diarrhea are less likely to occur. Women and children do not need to travel through areas littered with landmines and UXO to collect water. The communities also increase their ability to work together, and will continue to gain direct benefits from their work through accessing clean water for household use. Our partner in Cambodia is Teuk Sa’at, a local Cambodian non-governmental organization (NGO). The NGO specializes in drilling wells for target populations, assisting with the formation of water committees, hygiene education, well maintenance training and water testing. Teuk Sa’at prioritizes its activities to benefit the most vulnerable communities that suffer from lack of drinkable water, including schools and health centers. They also aim to improve overall health of communities by providing WATSAN education that includes proper water use and disposal, hand washing, domestic hygiene training and Dengue Fever, Malaria, and HIV/AIDS prevention. We use local resources whenever possible. Our Country Director is Chea Phan, a local Khmer citizen. Prior to actual drilling, village chiefs and leaders are approached with the idea of clean water wells in their villages. After an initial consent is signed to identify locations for wells and they agree to ongoing cleanliness and maintenance, the village is surveyed to determine population dispersion, number of people, geological and hydrological locations for wells and the locations of houses. Survey findings are discussed with the village leaders about the number and location of the wells. The village families on each prospective well must elect two water committees of four or five persons each. It is our goal to ensure that half of the water committee representatives are women. 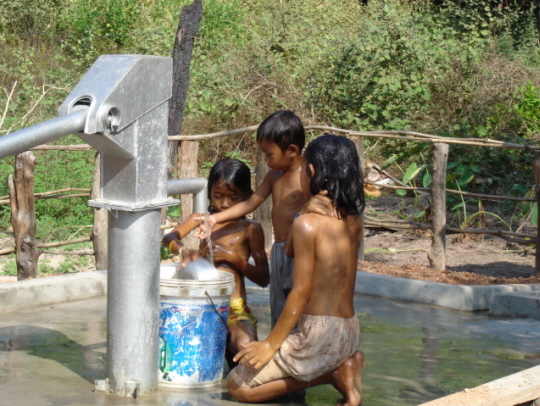 Access to clean water is one of the United Nations Millennium Development Goals (MDGs). Additionally, women's empowerment and gender equality are MDGs in their own right and central to all other development efforts. Even if the explicit Millennium Goals announced by the United Nations in 2000 are achieved, between 34 and 76 million people will perish from water-related diseases by the year 2020. We are committed to delivering outcomes and results on time and on budget. Moreover, we aim to partner and collaborate on future projects with other organizations as we continue sparking social changes in parts of the world where people are most in need. Linking mine action and development simply means that mine action is aligned with broader development priorities and programs at all levels. It is based on the recognition that landmines and explosive remnants of war (ERW) constrain post-conflict reconstruction and development. Mine clearance alone does not necessarily benefit people living in mine-affected areas. While landmine and unexploded ordnance (UXO) contamination often result during conflict, the legacy remains long after, impeding post-conflict reconstruction and development – hence the need for better coordination and linkages with development cooperation. Improved coordination and linkages result in greater recognition that landmine and UXO contamination is not just a humanitarian concern, but also an important constraint on post-conflict reconstruction and longer-term development. Humanitarian mine action is not just an issue of security, but it involves major socioeconomic and development impacts as well, especially regarding the provision of land, water and safety for the poor farming families in remote, rural areas. Our goals include integrating mine survivors back into society. The investment in education and monitoring for end users helps to ensure sustainability. As a result, the wells we build will last many years and provide communities ongoing access to clean safe water.